Kim Hollis: Unfriended, a Blumhouse horror film that takes place entirely on screens, earned $15.8 million. What do you think of this result? 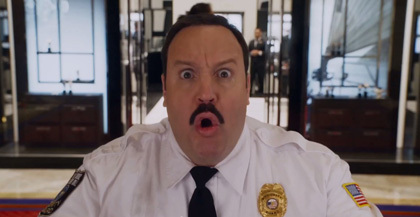 Matthew Huntley: Just like Paul Blart 2: Mall Cop 2's, this is an impressive opening weekend figure, but even more-so given how cheap it was to make this movie (it reportedly carries a production budget of just $1 million). Unfriended's surprisingly strong reviews and peculiar presentation may even allow it to escape the fate most horror movies face as far as huge weekend drop-offs, but if not, it's already shown a profit and, probably as we speak, a script is being written (or this one's is being copied) for Unfriended 2: [insert cheesy subtitle here]. In fact, the script for the sequel was probably already given the green light as early as Friday night (after the movie's opening day was approximately six times its production cost). Edwin Davies: This is a significant win for all involved. As Matthew said, the cost for Unfriended was tiny even by horror standards, and even if it cratered and ended up with a terrible 2.0, it'd still make 30 times its budget. This seems to be a combination of a lack of horror films in recent weeks other than It Follows, which is a less mainstream offering; the strong reviews; and the uniqueness of its premise, which would probably have appealed both to young audiences who use Skype and social media to communicate all the time, and to horror fans interested in seeing someone do something interesting with the genre. Whatever the cause, this is another success for Blumhouse, a company which has become incredibly savvy when it comes to turning low-budget horror into significant profits.